The hooked bill of this bird tells us that it's a raptor, and the small head tells us that it's a diurnal raptor and not an owl. The extensively white underparts aren't right for a Bald or Golden Eagle of any age. Also, the bill is too small for an eagle. An Osprey would have black upperparts and white underparts without the heavy streaking of our quiz bird. The mottled brownish upperparts, long tail, and heavy breast streaking suggest an accipiter, but note the fine, narrow banding on the tail; all of our accipiters have wide dark and light tail bands of roughly equal width. How about a falcon? All of our falcons have black eyes, that is the pupil and the iris are the same dark color. The iris of our quiz bird is lighter than and distinguishable from the dark pupil. 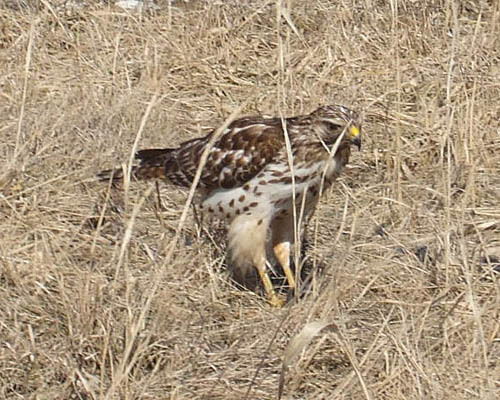 A Northern Harrier would have a distinct facial disc. Kites are slimmer and have longer primaries. That leaves buteos to consider. Six buteos have been recorded in Illinois, and 5 occur on a regular basis. Rough-legged and Ferruginous Hawks have legs feathered right down to the toes, and we can clearly see that the lower portions of the legs of our quiz bird are bare and unfeathered. The heavy breast streaking doesn't look right for a Red-tailed Hawk, the light morphs of which usually have an unmarked whitish breast and a streaked belly band. Also, the tail looks too long for a Red-tailed. A light morph Swainson's Hawk would show a dark bib on the upper breast and wings that nearly reach the end of the tail. On our quiz bird we can see that the wings fall well short of the end of the tail. That leaves Broad-winged and Red-shouldered Hawks, perched juveniles of which can be difficult to separate. Both have brownish upperparts and (usually) streaked underparts. The best way to tell these two apart is by noting the pattern of the folded secondaries. Adult and young Red-shouldered Hawks have distinct pale bands on these feathers while Broad-winged Hawks never do. The secondaries of our quiz bird are banded (click the image to see where the secondaries are). This young Red-shouldered Hawk was photographed on February 16, 2008 in Lake County, Indiana.